Exhibits : A largest existing collections of Kshatrapa inscriptions. Kutch Museum situated in the ancient city of Bhuj, in Kutch District is the oldest museum of Gujarat. The museum became a part of the School of Art established by Maharao Khengarji on July 1, 1877. The museum has the largest existing collections of Kshatrapa inscriptions which belong to the 1st century AD along with some samples of the extinct Kutchi script. It also has a collection of coins including the kori, Kutch's local currency. At the time of Maharao Khengarji’s marriage, an exhibition of Kutch arts and crafts were organized in which 5897 items were exhibited and items worth Rs. 3300 were given to the Museum. Thus, a need for new building was necessitated. As such, on 14th November, 1884, the foundation stone for the present museum building was laid by the British Governor of Mumbai, Sir James Fergusson and named Fergusson Museum after him by Maharao of Kutch. Designed by the state engineer Mc Lelland, the building's cost was about Rs. 32000. The museum remained a preserve of the Maharao who showed it only to his personal guests. Till Independence the Museum was open to the public only on religious occasions. However, after independence, the museum came to be known as the Kutch Museum and entry was open to all. Situated in the picturesque surroundings on the bank of beautiful Hamirsar Lake, just opposite to the Nazar Bagh Garden, the Kutch Museum has been constructed in a Gothic architectural style. The Kutch Museum consists of two floors of exhibit space . It has 11 sections - a picture gallery, an anthropological section, an archaeological section, a separate section on textiles, weapons, musical instruments, a shipping section etc. The archeological section has two Indus seals (one from Khirsara and a square one showing a unicorn from the Indus site of Dholavira) and different kinds of stone tablets. The oldest is dated during the reign of Sarangdev Waghela in the 14th century. Paintings showing different vocations of Kutch adorn the display. A section covering classical and musical instruments like various classical and folk instruments like Kani, Morchang, Nagfani, Dilruba and Veena give an insight into the ancient cultural practices in Kutch. There is a fine collection of Kutchi silver and golden work, enamellings, textiles, wood work, coins, old utensils and other archeological objects. Here, a section on the communications of the district is also available. A section of the museum is devoted to tribal cultures, with many examples of ancient artifacts, folk arts and crafts and information about the tribal peoples. Other than thesem, the museum also has exhibits of embroidery work, paintings, arms, musical instruments, sculptures and metalwork. The textiles section displays various textiles, fabrics and embroidered clothes of the tribes of Bhuj, while the music section displays collection of musical instruments like veena, dilruba, along with folk musical instruments like kani, nagfani, morchang etc. The shipping section displays of Mandvi, artifacts, old coins, specimens of nut and knives crackers, ornaments, silver dishes etc. On the ground floor in the central room is displayed Airavat, an Indian elephant, a carved, wooden, snow white elephant with seven tusks. It's body is painted in the local kamagiri style with flowers and creepers. 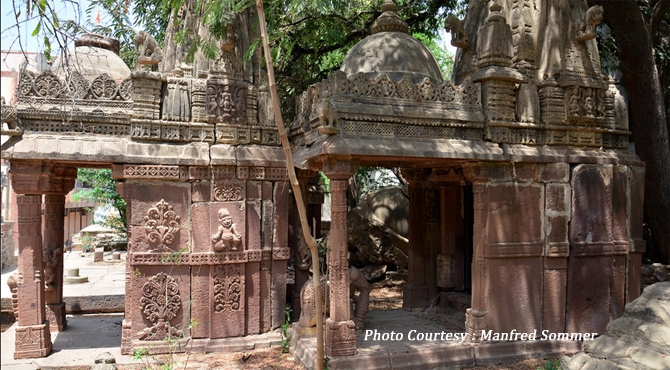 Airavat was made in Mandvi in the 18th century in the worship of Tirthankar. The rest of its body is painted with flowers. Govt. of India issued a postal stamp showing this Airavat in memory of this amazing creation. Sharad Bagh Palace, Swami Narayan Temple and Folk Museum situated nearby are worth visiting. Photography and Videography are allowed.